The Manuscript Collections of the Archives document the people, history, culture, and politics of Hawaiʻi. These collections support scholarly research, teaching and public awareness, as well as promote an understanding of Hawaiʻi‘s rich multicultural heritage. Robert Aitken was a teacher at UH, a social activist, an author, and a Zen Master. He was a founding member of the American Friends Service Committee, Hawaiʻi and also founded the Diamond Sangha, a Zen Buddhist organization headquartered in Honolulu. Anderson, who became professor of education at UH, served as the Education Officer of I Corps of the US Army in Japan from 1946 to approximately 1950. These papers document his efforts at educational reform in Japan. Arthur Goodfriend was a meticulous recorder of his own life. He created scrapbook journals out of his over 90 years of experiences and adventures. Approximately 35 journals, an oral history, and the scrapbook of an autobiography are included in this collection. This international organization working for peaceful reconciliation between nations began in Honolulu, holding its first biennial conference in 1925. 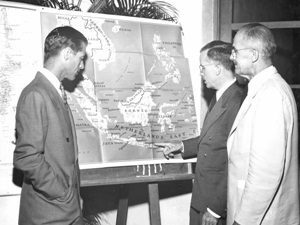 In the mid-1930s, the International Secretariat moved to New York City, but the Honolulu group remained active until the McCarthy Era in the 1950s. This Hawaiʻi organization focuses upon education of secondary school students in international relations. It came into existence in December 1953 as a reorganization of the Honolulu Branch of the Institute of Pacific Relations, totally severing ties with IPR. Founded in 1917, the Pan Pacific Union served as a creative outlet for those in Hawaiʻi interested in international and intercultural relations. It’s founder, Alexander Hume Ford, believed that multi-ethnic Hawaiʻi was a compelling model for improving relations in an increasingly interconnected world. The Oliver Statler Collection is the accumulated materials that were the basis for the scholarly writings of Oliver Statler, most notably, Japanese Inn, Japanese Pilgrimage, and Shimoda Story. The collection consists of materials that also provide insights into his personal and professional relationships, including correspondence, research notes, manuscripts, source materials, brochures, clippings, postcards, maps, art prints, photographs, slides, films, audiotapes and more. Whiting researched into several issues in nutrition among numerous peoples in the developing world, especially concerning foods resulting in health problems, particularly toxicity of Cycads, carcinogenic foods, cardiovascular diseases, and lathyrism/odoratism. The World War II Manuscript Collections document the impact of the War in Hawaiʻi from both a military and civilian perspective and provide insight into the war’s influence on Hawaiʻi‘s culture, politics, economics, and social structure.